How to book the cheapest flights? The one thing I always have in mind when travelling is having enough money to enjoy the trip itself and not being stuck to the hotel's meals or constantly having to look to the wallet to check if there is enough until going back home. Freedom of traveling means to have a mind clear of our day by day routines, and this includes having to check money all the time. When travelling it is very important to try and plan things ahead, but at the same time having the space to change if something interesting comes along. This is actually the fun part of travelling, right? Part of the planning is, of course, booking the flights. Today we have thousands of options and it becomes very hard to decide. The longer it takes this decision, the more expensive it can be. Trying to book a flight at least 2 or 3 months before the trip itself is very important. But is this enough? Well... it is not. Travel should be done off peak season. This means that you may have to face not so pleasant weather conditions, but nowadays, unfortunately, this is not such a big problem, as the conditions change all the time and seasons are not so defined anymore. Besides seasons, also is important to define the times to travel outside work transport times. This means you probably have to wake up very early or to wait a lot for your flight, but at the end of the day, it is worth it! Well, nobody wants to do it. It's always terrible when you have to wait a few hours for the next plane, but at the end of the day you are travelling and you can enjoy yourself a nice book or just browsing internet on what you can do on your destination. Me an my girlfriend rarely take an extra bag on the back of the plane. This means I usually loose space as a man! But, I do not care. I learned how to be extra compact on the things I take on my travelings. I learned this very well when coming to live to Holland. And the less things you have, the less you worry about it. I just need a little corner for my camera. Sometimes we take too much time checking the flights and then we forget that we add costs when we travel there. Here in Holland we have a very nice and cheap service called Flixbus. The travel takes longer, but it is amazing. It is a nice bus with a toilet and internet connection. It is very comfortable and it allows me to think about the destination once again. Don't get stuck on the same airlines to flight to your destination and back! Just feel yourself free to use online tools and check which ones are the most affordable. Match all your online information of the flights with travelling agencies. Sometimes it is much easier to let the agencies take care of everything. And because most of them are checking the transport to and from the airport, or also paying for the parking fees, if you leave your car there, it becomes a very good option. We did it when going to Bulgaria. Some agencies learned that they had to low their costs to become competitive, so it is a good idea to check their deals. 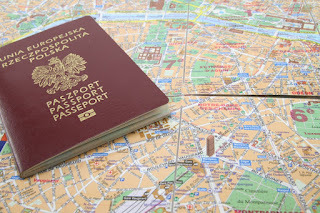 Again this is an amazing way to not only save money on your trip, but also to check destinations that you never though of before. In our Summer vacations we had extra days free and decided to check what Groningen Airport could offer us. And we travel to Gdansk. Never did I before though of going there. And it was so impressive, as you can read in this website. I know.... it is vacation time so let's do everything. No! You can save on different ways and you can enjoy so much more in your destinations. Take some food to have on the way or in the airport. It will save you so much money. We know how expensive the airports are! Check your bags weight at home! After so many years of travelling I took this for granted. And on the way to Poland, there I forgot to check the dimensions of my luggage. And the worst happened. I had to pay extra 60€ for it! Almost the price of my plane ticket (75€). Always check again. The dimensions change even between low cost flights. Get your travel insurance elsewhere! Don't leave it to the airlines. It is so expensive. And I you can check your bank for some travel insurances. You can save so much money. No doubt that this is my favourite tool when traveling. It is very easy to use and it will give you an overall view of the cost of the flights around the days you are trying to plan. With one click you can change the day to go and come back and it makes the calculations automatically. And there is no commission. 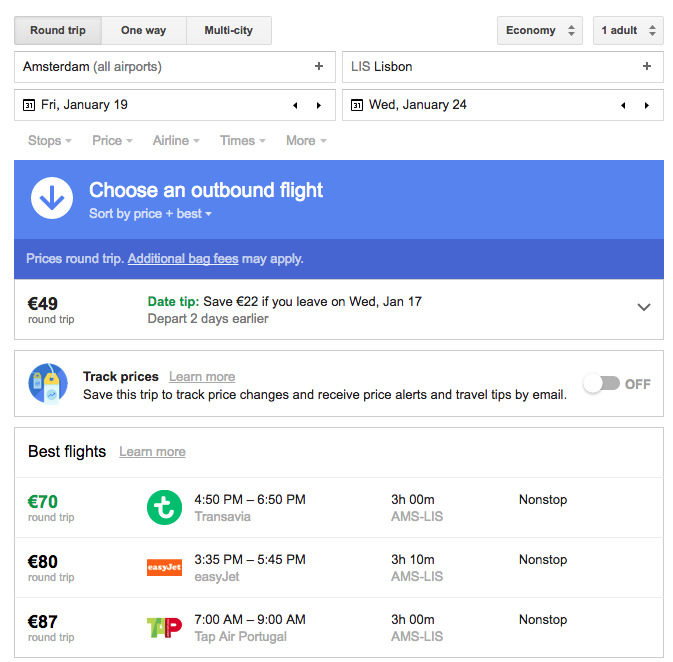 Google is just showing you the information from the airlines websites and it will not add any extra costs like many services out there. There is no delay when you hit search. It is just immediate results. Choose Round trip, One way or Multi-city. Enter your departure city and destination. If you are logged in into google you will have a default location based on your current city, or an early search you may have done. You will be provided with the best and cheaper options to travel. You can choose based on time, cost or nonstop/indirect flight. Also you can hit the button Track Prices so that you receive updates on the flight costs on your email. You can also narrow your choices by number of stops, price, airlines, times and more. When you are done just choose your flights and google will redirect you to the websites, so that you can finish the booking process. The magic happens if you click on the calendar of departure or arrival dates, and you will be able to check in real time the prices of the flights in different days. This will allow you to choose the best and most affordable flight.